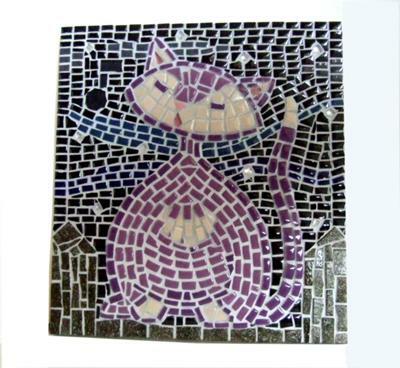 I had just finished a mosaic of two cats out on a starry night and wanted to continue the cat theme. I designed her myself, she's lovely, purple, and plump. The purple is recycled glass which I was trying for the first time. It is thicker than vitreous glass, but easy to cut. The rest is a mix of vitreous and ceramic tile.